Each week - we are asked about what we are doing. So, in my spare time (this has been said “tongue in cheek”) I have decided to write a post on Things you should know about what we are doing: for those of you who still are not SURE about what it is we are building. This idea is not mine. It is God’s. Back in 2000, God entrusted his plan to me. Not sure why he picked me, but He did. At first, I wasn’t sure I was hearing him right. But He made that pretty obvious, pretty quickly, that I was hearing “His” plan for retreat ministry for women. This idea has been 12 years in the making. At the time I was working as the Director/Founder of Sugar-N-Spice Kiddie Haven Inc. (an 80 space childcare center). In 2001, He made it very clear that I was done there. Clear - right down to confirming the date. December 31, 2001 - I walked out of the daycare, locked the door, and closed an almost 21 year chapter of my life. We incorporated as Women Refreshed at the Well, and in 2001, became a registered non-profit organization with a charitable number. What does this mean? This means that if you would like to donate financially to Women refreshed at the Well - then we can issue you an official receipt for income tax purposes. We have a board of directors. Currently the board is 8 strong. 4 are official board members and 4 are in the capacity of an advisory board. We are looking for more board members. In 2008, God laid an idea on the heart of my son and daughter-in-law. To be honest, Alvin and I had tossed around this idea a bit. Josh and Leah suggested that we sell our home in Anola, and buy land just outside the city limits and build a house with a combined living space for us and retreat ministry. 2009 - we (personally) purchased land (which is a God-story in itself) on Henderson Hwy. That fall we hosted a “come walk and pray” event on the land. We wanted it to be bathed in prayer prior to turning sod. People came. People prayed. 2010 - April - we sold our family home and 65 acres of land in Anola. 2010 - June - Alvin began the barn/shop. The reason we did this first was so that when we moved, we could move our stuff from the shop in Anola - right into the shop on Henderson. 2010 - July 31 - 27 year chapter of our lives closed when Alvin and I left the place at 11 pm, with one final load, and eyes full of tears. We began living in temporary housing, which we are still living in today. 2010 - fall - basement dug for the house - and the build begins. Did we truly understand what laid ahead - the money commitment - the time commitment - the joys - the hard stuff - the physical and emotional involvement. Little did we know. But God did. Why did we sell and move out of our home before our new house was even started? Yes, you are likely wondering why - because you see, most people would not leave a home - and actually WANT to live like a gypsy if they really had a choice. At this point, I am into this gypsy style of living - by 22 months. What seemed like an adventure at first - has become a weird mix of comfort but also a restlessness to finally live somewhere that has actual rooms in it. SO WHY DID WE DO IT THIS WAY? The house is way bigger than anything that we ever thought we would build. God brought the architect for the project out of our circle of friends/church family. Jerald Peters was a God-send. (There is a real God-story here too!) However - because the details God entrusted to us included a space for 5 women to stay at any given time - we needed 5 bedrooms dedicated to retreaters. That detail in itself adds many square feet on. We have recently visited a brand new B&B just north of Selkirk that is 10,000. It is absolutely beautiful - absolutely roomy - and absolutely huge. Our space is big but thankfully not that big. The rooms are not huge. But they are sufficient. There are other spaces where people can retreat to - either to be alone - or together. What kind of women will come? Well ... do you have a sister? hmmm - do you have a wife that needs some time away to renew? Are YOU that wife/mom/sister/grandmother/friend? We are hoping that women - from all walks of life - all ages - all professions - students - career people - retired .... this is for women to come and retreat to. What happens if angry husbands show up at the door for their abused wives? It seems that in the neighborhood, someone got the wrong impression of what we are planning to do. So we are slowly trying to dispel the rumour, calm nerves, and explain the concept! We are not opening up a REFUGE for battered or abused women. Granted, I believe there is a need somewhere for that. But that is NOT what we are doing. This is a RETREAT/B&B for women. NOT a shelter. Not a refuge. Not a place for RESPITE per say. We want to provide a place for women to come and just “be” ~ to retreat, to renew, to refresh and to refuel. While I am a believer in Jesus Christ, women of all faiths, or women with no faith - are all welcomed. I am hoping that regardless - you will feel warmth, caring and love in our place. HOWEVER there WILL be some intentional times planned in our calendar that will include "christian" themed retreat times. Maybe if I am sick sometime - I can come? This was the comment one person made to me on the phone. She thought it was for a place for sick people to come and get respite. Once again ~ we are hoping that if you are sick - you will find a place that can take care of you. If you are needing a break - a day and night away (or two) - and just want a place to unwind, and to sit and read, or walk, or perhaps even to just sleep ~ then this is for you. How will you make ends meet? Well - there will be a cost for your stay. We are in the process of figuring that out now. However - NO ONE will ever be turned away because they can’t afford it. We will have different costs - depending on whether you stay for the day only, the day and night, etc. We also hope that people will buy gift certificates so that you can gift a retreat day to someone. Also, we want to establish a fund whereby people can donate specifically to help offset the cost of a retreat stay for someone. All of this is currently being worked on. We have already been very blessed through volunteers who have come and helped both Alvin and myself - on various things. And - there will be lots of room for volunteers to help out ~ specifically in the garden! I love to care for people. I love gardens. However, I am not a huge caretaker of the greens!! (just ask my husband how our plants have to literally wilt before I realize they need water!) A dear friend is currently working on the garden plan - but it will need gardeners to help take care of it! What else may happen at 5839 Henderson? Why is your business called Season's Song - how does this correspond with Women Refreshed at the Well? Under the RM of St. Clement - we have taken out a business license under Season’s Song. This is the name we chose as a family. SInce the house is ours (our financial investment) we will let God work through us and it. 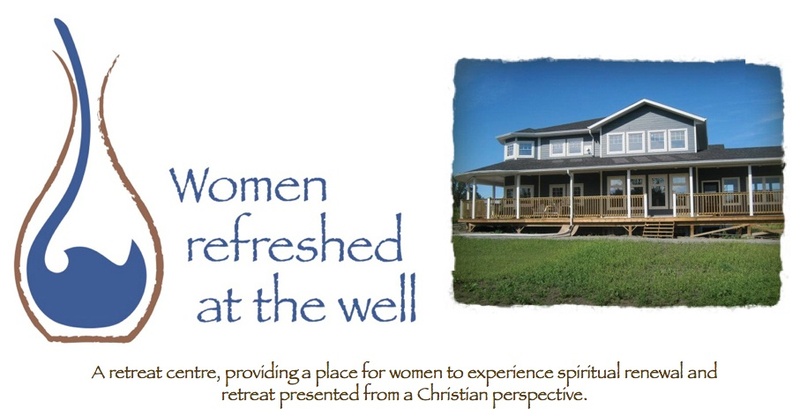 The main thing we will be doing (front and foremost at this point) is the retreat ministry for Women refreshed at the Well. Our home will be the site that WRATW uses for retreats. This likely makes no sense the way I wrote it - but it was after we got some advice - that this is the best way to operate. What is the hardest thing right now? Okay - can I am being brutally honest. The hardest thing right now is when people say “What - you aren't in the house yet? You are still building? What is it - a three year project?" Yes, I have been asked that. It was in passing - and I likely gave the person a blunt answer. Maybe I am a little protective of my husband (not that he needs it) but the thing that IS hard some days, is when we are reminded (not that we are unaware any how) that yes, we have been building SOMETHING since June of 2010. In less than two years, Alvin has built a 2400 square foot barn/shop with a loft and he has also built the house - which is very close to completion. Yes, it is taking way longer than we thought. One component of the build (something we had planned on) changed pretty significantly right at the beginning and it had a very obvious effect on the build. Sometimes that happens, and it is out of your/our control. Alvin is working every spare moment, believe me. I am not complaining (although sometimes I do) but THIS BUILD IS OUR LIFE apart from a week away in 2010 and a week away this year. When he is not at the firehall - then he is here. We are very thankful for the help along the way - both family - friends - paid - and volunteer help. You are part of our story. My prayer from the very beginning was that we would emerge intact, on the other end of this build. Intact as individuals. Intact as a family. If you want stress ~ just add a build to your lives. It is really not for the weak kneed or faint at heart. Really. Another question that we hear a lot: When are you going to open? SO WHEN will we open? Only God knows. All I know is that we will know when it is time. First it has to be finished. Then we have to finish furnishing it. Then we have to move in. (or move in and then finish furnishing). AND THEN ... we will begin. Then there is the other famous question: Do you really think women will come? Well. Here are our thoughts. Alvin and I are in agreement on this. It reminds me of the movie “Field of Dreams” where the guy (I think it was Kevin Costner?) pulls out all the stops and makes a baseball field - a major field at that. He keeps hearing “build it and they will come”. The other story that I keep think of is the story of Noah. God told him that he needed to build an ark - because it was going to rain. So Noah worked and worked and worked. His family helped. People watched. People no doubt asked him if he knew what he was doing. Noah - are you going to need that big monstrosity? We have felt like Noah - in fact a couple times I referred to something as my “Noah moment”. We have also felt like we head “build it and they will come”. You know - the real bottom line? Honestly, it would have been easier to take our money from our anola home and buy ourselves a little condo and sit back and enjoy the rest of our lives. BUT God called us to something. First He called me. He entrusted ME with a plan. Not sure why He chose me, but he did. Then He brought Alvin alongside. Without him, nothing would be built! God moved Alvin’s heart - and did the convincing about this project. We do not know if women will come/when they will come/how many will come. BUT what we do know is that we are being obedient to the call of God on our lives pertaining to this ministry. We do know that He (God) gave us the vision to build a place for women to just come to - and be pampered - be loved on - be able to renew as they relax and retreat. That is what we know. So will women come? WELL ... we firmly believe this is God’s project. This is God’s vision. And the reality is - God doesn’t do things that fail! SO, we are trusting him on this one. We know that we are 54 - and as ALvin said the other day - “I have more days behind me than in front of me at this point.” We know we are called and we want to be found faithful. We know that sometimes, we feel like we want to go running back to the comfort of our Anola Home. We know sometimes that we are so tired, we can barely keep our eyelids open until we hit the pillows! We know that other people would have taken their money and bought something for themselves, instead of investing it into a house that will be used MAINLY for others. We know that sometimes when we follow God - we don’t see the whole plan until we look back at it. We are okay with that. One day it will look complete. That has always been our experience. Looking back is always 20/20. even though we are not normally risk takers - it seems we have stepped out on a limb for Him. And trusting HIM. Back in 2000 I read a book by John Ortberg called “If you want to walk on water, you have to step out of the boat.” Well, all I can say is - at this point - the boat seems a long way away - and it is only through God’s grace and mighty hand - that we are walking and trusting Him to keep us dry! I would love to come! It would be a great spot to spend a couple of days working on my book! Love your spirit to fulfill God's will for you! His timing is perfect and when the time comes to open your doors, they will come. We could use something like this in Southern Ontario! Janice - and I would love to meet you - and get to know you - and be able to serve you in this way! Any relative in the Nicholson family is someone I would love to meet! I hope that when we are up and running - we can have you for a stay! Way to go on your book! That is something I have started and just put on a back burner. Love to you and your family! !